Creating your first Shopify store or giving your store a new look? More than 80% of the online population shop online for their goods and services which means having your own Shopify store is a pretty good idea! But you probably need to some help for 2019 to increase sales and grow your Shopify. There are a lot of successful Shopify stores out there that you can learn from. I'll be showing you five successful Shopify Store examples to model in 2019. I'll not only be showing you these stores are but what you can apply to your own Shopify store to see that success come your way. Owned by Kim Kardashian, who is just one of the many celebrities that use Shopify to sell her products. KKW is a very popular beauty brand making waves in the beauty industry. KKW host periodic sales that usually sold out in minutes if not seconds. Listed as arguably one of the best Make-up Shopify stores out there. But it isn't just Kim's recognition that attracts buyers to the store but the appealing aesthetic and color scheme of the site, high-quality product images and simple website layout that makes purchasing fun. Have a great brand aesthetic or theme for your website that matches your brand. 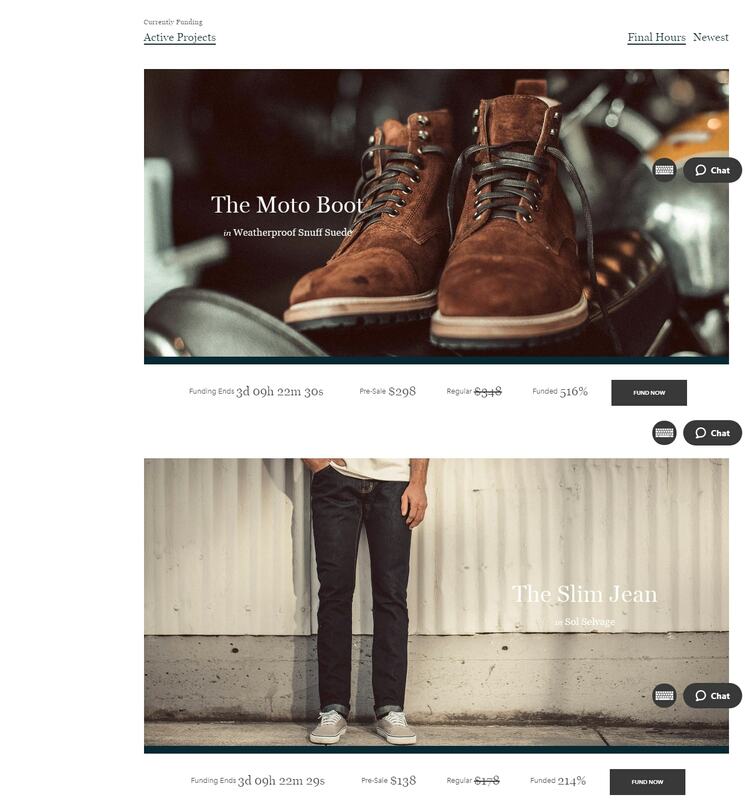 Pro tip: Check out Shopify's paid theme marketplace. While a bit more expensive upfront, these themes often come with multiple color schemes and built-in functionality that will pay dividends to your brand image down the road. One of the easiest and important ways to keep people on your website is the colors and images you use and how it reflects your brand or product. The color and aesthetics are the first impressions of your website before your customer even thinks about your product. Every color sends out a message, and it is up to you to send the message right. Having an overall theme or aesthetic for your website lets visitor see your brand as well put together. 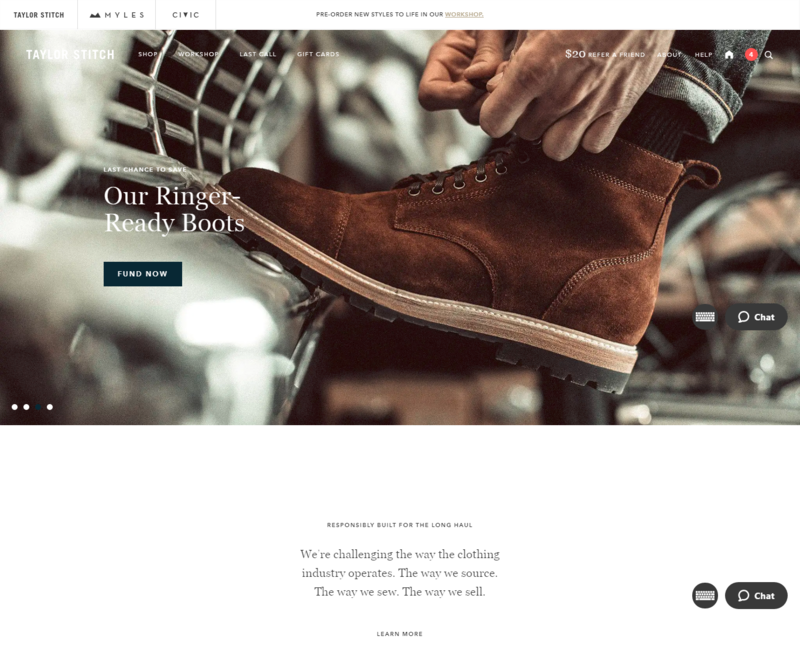 It's one of the reasons most people like some Shopify themes more than others — the simple colors and aesthetics. Don’t take it from granted, have you ever stayed on a website you didn't like or was too hard to look to? Nope... Not unless you absolutely had to and shopper don’t have to go on your site. We want shoppers to be excited to stay on your site and buy. Ultimately the point of your store is to sell so have a theme that is designed to sell as well. When it comes to Shopify looks do matter! 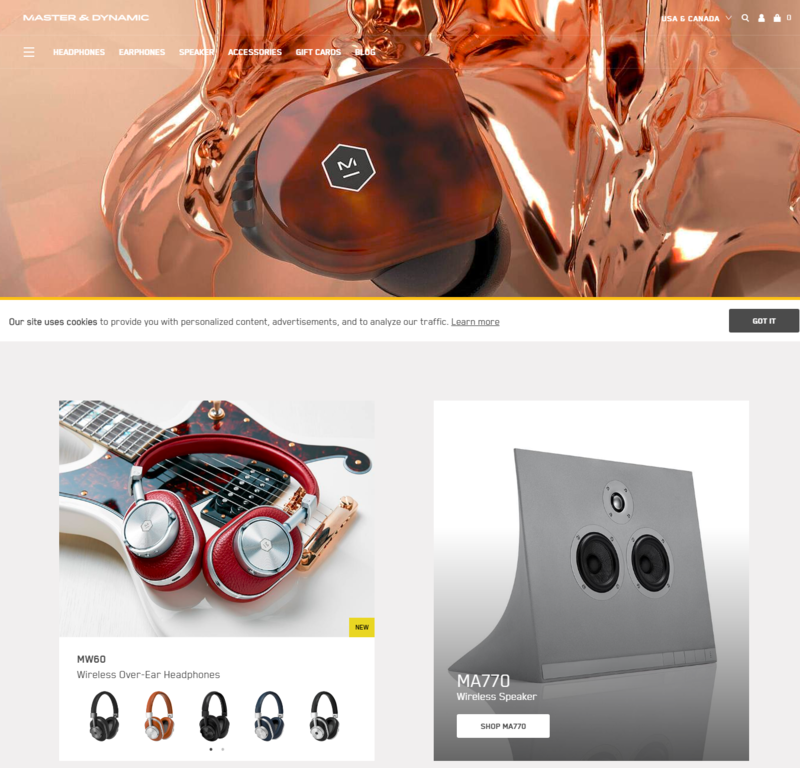 This New York-based company Shopify store host a range of high-quality headphones and audio accessories. If your a music lover then this Shopfiy store provides one of the best headsets you'll ever have. Generating over millions in revenue from their store alone and making a name for themselves to rival against Beats by Dre in the headphone industry. One the reasons this product sells so well is the high quality in product photography and display. You get to see what you're buying before you even add it to cart, from colors, style, and size. Giving you the impression that the headphones are right in front of you. Your customers need to see what they’re buying. The product image needs to be professional or placed in a lifestyle setting so that they are more willing to buy. No matter how good your product is without the right pictures, it'll still make shopper hesitant to buy your product. Have great product photos and descriptions. Pro tip: Check out Amazon's Portable Photo Studio for quick and professional images. It also comes with a built-in app that helps create high-quality images using your smartphone. It's definitely something worth investing in, no matter how small your Shopify store is or little products you have. See what foxy.io had to say on why good products matter and how to take them. Built around the message of making women feel confident and comfortable in their underwear and bodies, this brand's Shopify store has been successful with a 150% growth in revenue in just three years. They were so successful they faced out of stock issues for a year due to high demands in sales and an even longer waiting list. Now that's a problem you want for your store. Navigation and text of this site are effortless. Within a few clicks, you can quickly and easily make your way to any part of the site. Pro tip: If you're interested in upgrading your website's ease of use, here are 10 steps for better website navigation. Page Navigation is important for your Shopify store because it allows potential and returning customers to feel at ease to make purchases from you or getting to know your brand. Take a look at Negative Underwear topics and navigation. It's uncluttered, straight to the point and organized. The smoother the navigation, the better the customer experience on your Shopify store, the easier it is to make a purchase and get sales. It's a win-win for you and your shoppers. Have you ever gone on a site and had to click through hoops for just one product? That can be frustrating for anyone. Take a look at your Shopify page's navigation and compare it to these sites. This Australian based company made its debut in 2012 with its mission to sell all-natural detox teas and help those who want a healthy lifestyle. After only 9 months this Shopify store earned $600k in monthly revenue and a massive following on social media. To this day they still earn massive revenue from their teas worldwide. 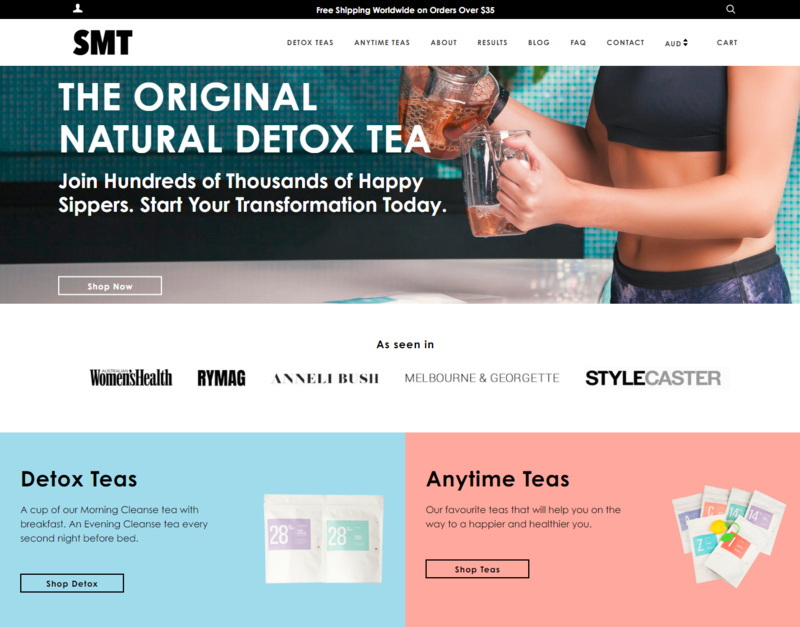 SkinnyMe Tea didn't just sell tea, they first ensured to sell the lifestyle around their tea and built a community of people within their niche content; health, fitness, and wellness. But how do you do all that? The secret ingredient for their teas selling success was having a great blog on their Shopify store as brand content. It isn't enough to sell your product but to have content that connects and attracts readers to see the benefits of buying your product. 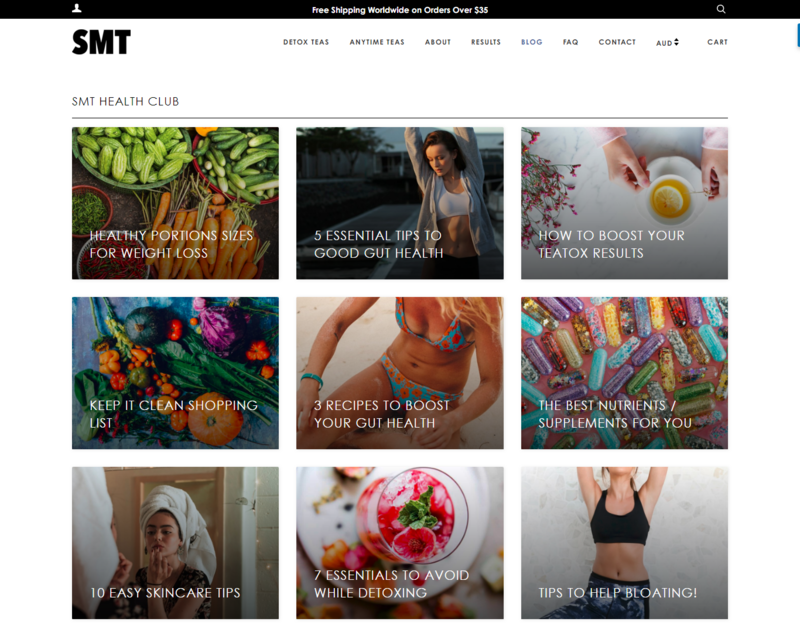 SkinnyMe Tea did this by creating a blog centered around advice and tips on being healthy plus showcasing their products in lifestyle images ( like what we talked about before). They, in essence, marketed their Shopify store in a way that didn't feel like sell, sell, sell. Focus on building a community through content. Pro tip: For step-by-step instruction on how to setup a content marketing strategy for your e-commerce store, check out 30 Reliable Ecommerce Marketing Strategies. It may seem like a lot of work in the beginning, but the payoff is worth it. Having a blog or branded content on your website is a proven way to build credibility, create a community and bring sales to your store. Isn't that the type of success you want for your Shopify Store? This Shopify store launched in 2010 and sells menswear; custom made and tailored. They are highly focused on the needs of their customer's needs and wants. After three years since their launch, Taylor Stitch has gained over 15 million in sales and continued to grow even more as we speak. Understand your customers to tailor your content, product, and store. Pro tip: Not sure how to figure out your ideal customer? Check out Shopify's video on How to Determine Your Target Market. But what does this have to do with selling products on Shopify Store? Understanding your customers want will enable you to fine-tune your store with needs and wants of your customers to increase traffic and sales for your store. The owner of Taylor Stitch stated that it took them 10 years of customer feedback before and during the launch of their Shopify store to fine tune who and what their customers wanted. With each change made revenue increased by 60% or more. You can also know which the apps, tools, improved navigation you may need to have for your store. I’ve listed at the end of this blog. Taylor Stitch realized that so many of their customers wanted new and innovative products so they created a "Workshop." Where they design new products and customer who wanted them could crowdfund them and save 20% off on their purchase. They deliver them when they’re seasonally appropriate. The response was overwhelming in over 100,000 in revenues for the first six months of the Workshop. For starters, you can recall or ask for feedback from your customers and work from there. Have a brand theme or aesthetics for your store. Great product photos and clear product descriptions. Here are top 6 Shopify store apps you'll need to improve your Shopify store for 2019. This app is a great way to show your customers your site is secure and trustworthy. This allows your customers to leave reviews which can be a great sale driver for potential customers viewing your site. Use this app for successful email automation when someone orders a product, abandon cart reminders and product updates to help grow your Shopify store. Instagram gives brands higher organic engagement than any other social platform. Letting your customers see your products in real time. This app helps notify your customer (you guessed it) that your item is out of stock, but they can also be notified when it's back in stock. One of my personal favorite Shopify apps. It helps you to edit a completed order on Shopify. From the product, and price to the billing address, Edit Order has got you covered. Have a Shopify Store of your own or one you love the most? Drop a comment about what helped your Shopify Store or better your experience. I'd love like to know!